Ocean acidification (OA) is predicted to reduce reef coral calcification rates and threaten the long-term growth of coral reefs under climate change. Reduced coral growth at elevated pCO2 may be buffered by sufficiently high irradiances; however, the interactive effects of OA and irradiance on other fundamental aspects of coral physiology, such as the composition and energetics of coral biomass, remain largely unexplored. This study tested the effects of two light treatments (7.5 versus 15.7 mol photons m−2 d−1) at ambient or elevated pCO2 (435 versus 957 µatm) on calcification, photopigment and symbiont densities, biomass reserves (lipids, carbohydrates, proteins), and biomass energy content (kJ) of the reef coral Pocillopora acuta from Kāne‘ohe Bay, Hawai‘i. While pCO2 and light had no effect on either area- or biomass-normalized calcification, tissue lipids gdw−1 and kJ gdw−1 were reduced 15% and 14% at high pCO2, and carbohydrate content increased 15% under high light. The combination of high light and high pCO2 reduced protein biomass (per unit area) by approximately 20%. Thus, under ecologically relevant irradiances, P. acuta in Kāne‘ohe Bay does not exhibit OA-driven reductions in calcification reported for other corals; however, reductions in tissue lipids, energy content and protein biomass suggest OA induced an energetic deficit and compensatory catabolism of tissue biomass. The null effects of OA on calcification at two irradiances support a growing body of work concluding some reef corals may be able to employ compensatory physiological mechanisms that maintain present-day levels of calcification under OA. However, negative effects of OA on P. acuta biomass composition and energy content may impact the long-term performance and scope for growth of this species in a high pCO2 world. I summarize marine studies on plastic versus adaptive responses to global change. Due to the lack of time series, this review focuses largely on the potential for adaptive evolution in marine animals and plants. The approaches were mainly synchronic comparisons of phenotypically divergent populations, substituting spatial contrasts in temperature or CO2 environments for temporal changes, or in assessments of adaptive genetic diversity within populations for traits important under global change. The available literature is biased towards gastropods, crustaceans, cnidarians and macroalgae. Focal traits were mostly environmental tolerances, which correspond to phenotypic buffering, a plasticity type that maintains a functional phenotype despite external disturbance. Almost all studies address coastal species that are already today exposed to fluctuations in temperature, pH and oxygen levels. Recommendations for future research include (i) initiation and analyses of observational and experimental temporal studies encompassing diverse phenotypic traits (including diapausing cues, dispersal traits, reproductive timing, morphology) (ii) quantification of nongenetic trans-generational effects along with components of additive genetic variance (iii) adaptive changes in microbe–host associations under the holobiont model in response to global change (iv) evolution of plasticity patterns under increasingly fluctuating environments and extreme conditions and (v) joint consideration of demography and evolutionary adaptation in evolutionary rescue approaches. 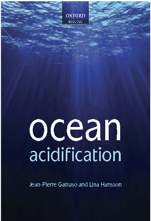 Ocean acidification is discussed in Section 3 of this book chapter. 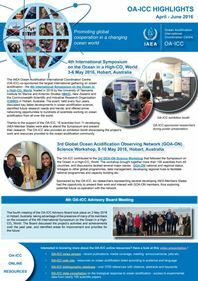 We investigate the biogeochemistry of Low Dissolved Oxygen High Nitrate layers forming against the backdrop of several interleaving regional water masses in the Eastern Indian Ocean, off northwest Australia adjacent to Ningaloo Reef. These water masses, including the forming Leeuwin Current, have been shown directly to impact the ecological function of Ningaloo Reef and other iconic coastal habitats downstream. Our results indicate that LODHN layers are formed from multiple subduction events of the Eastern Gyral Current beneath the Leeuwin Current (LC); the LC originates from both the Indonesian Throughflow and tropical Indian Ocean. Density differences of up to 0.025 kg m−3 between the Eastern Gyral Current and the Leeuwin Current produce sharp gradients that can trap high concentrations of particles (measured as low transmission) along the density interfaces. The oxidation of the trapped particulate matter results in local depletion of dissolved oxygen and regeneration of dissolved nitrate (nitrification). We document an associated increase in total dissolved carbon dioxide, which lowers the seawater pH by 0.04 units. Based on isotopic measurements (δ15N and δ18O) of dissolved nitrate, we determine that ∼40–100% of the nitrate found in LODHN layers is likely to originate from nitrogen fixation, and that regionally, the importance of N fixation in contributing to LODHN layers is likely be highest at the surface and offshore.